A unique private dating and social networking platform for real people to stay connected with each other over this trusted platform. 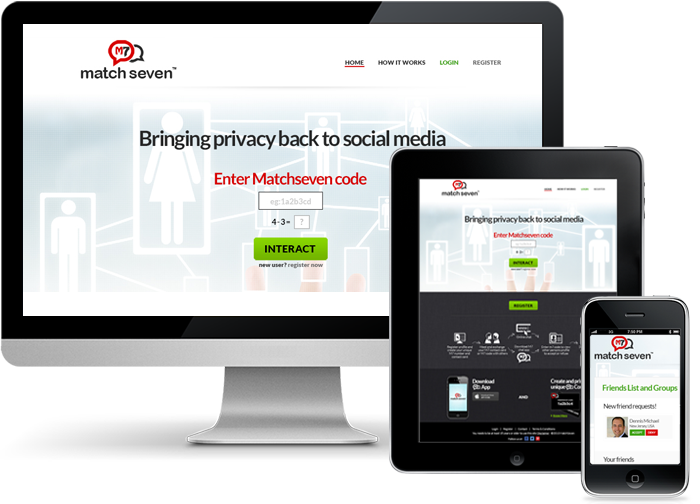 MatchSeven is a private dating community for users who have met each other personally at least once and have exchanged their MatchSeven codes to stay connected. Every user has a unique M7 codes which forms a base identity and authenticity of a user on this networking portal. A business card can be created with the M7 code on it to be handed out or shared with people whom they meet and want to stay connected. We have developed their web and mobile applications. Client came to us with this concept and we immediately felt confident of this idea and the passion he had. We decided to be their development partners and began this journey with providing them initial support in consultancy and researched the best possible set of features and functionalities for launch. Since the idea was new and never been done before at this scale, it needed dedicated time and effort for gathering the right requirements and building a web and mobile strategy. We needed to research the subject matter and the industry involved to try to focus on the specific niche of social networking. This would be a technically challenging application to build a simple usable web and mobile application. Our client had high expectations on the responsiveness of the design and had a high focus on user experience, security against data leaks, chat functionality and testing on all browsers with development for IOS and Android mobile applications. Development was on a restricted budget so all parts needed to be done on time with high quality product delivery. A dedicated team was set up with a project manager to create the requirements document and to develop the initial wireframe of the website and mobile applications. A product development methodology was initiated for all parts of the design and delivery of the project. To determine how the algorithms function in real time, we mapped every result with the Functional Specifications and the Proof of Concept (POC) we developed during the start of the project. The client was very happy with the launching of the website along with all native applications including mobile device applications. The client submitted the website to Techcrunch for initial launch of the application and received great feedback from all users. Client is happy with the results and with the way his ideas were executed and implemented. He will now apply for funding.